Kno Inc, a company founded by Osman Rashid and Babur Habib, unveiled the first dual screen “digital textbook” aimed at the academic market in June this year. The company aims to provide a unique tablet with all possible functions and help to college students and it was announced today by the founders that they will also be launching a single screen Kno tablet for students soon. Kno Inc recently received $ 46 million from Andreesen Horowitz, Silicon Valley Bank and TriplePoint Capital to develop their dual screen tablet which they claim will be “the most powerful tablet anyone has ever made”. The original Kno tablet has two 14.1” touchscreens which display a complete textbook without scrolling, opens flat like a book and also folds back on itself as a single panel slate. As the Kno tablet is specifically designed for academics, it supports Pen Stylus which retains writing with one’s hands and students can take notes and scribble on the Kno like they would on a paper notebook. 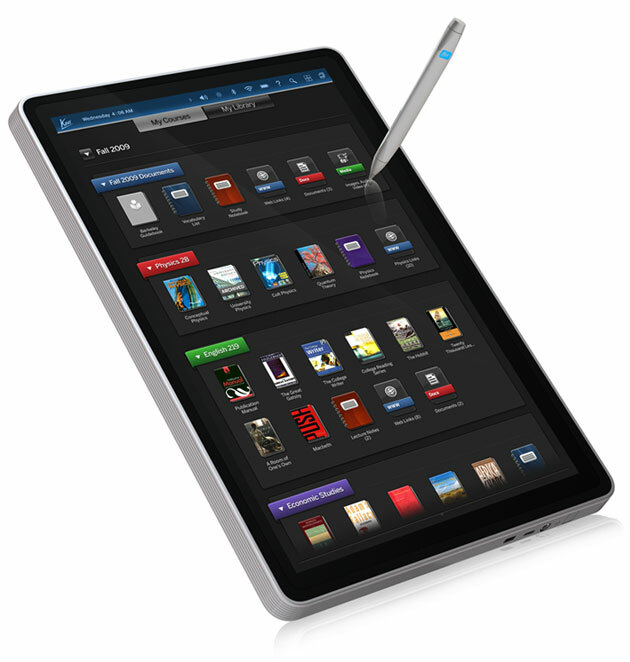 The tablet has great high resolution video capability and the tablet glides from a textbook to a video device easily. Its batteries will last a full day on campus and can carry eight terms’ textbooks, notes, documents and media. Founders Osman Rashid and Babur Habib stated today at a tech conference that the single screen version of Kno will obviously be cheaper and more affordable for students and will also provide other interactive learning features such as the ability to collaborate, access and navigate course materials and text books by image as well as a write-on/touch screen for notes. Even though the Kno pays for itself in 13 months, the smaller up front investment of the single screen version will allow more students to use our learning platform. Said Osman Rashid at the event. Osman Rashid and Babur Habib are also behind the physical textbook rental company Chegg which also recently received $ 75 million in series D funding. The Kno tablet is definitely different than all other tablets in the market as it targets a completely different market and its aims are academic rather than pleasure based. The company might just deliver on their “most powerful tablet anyone has ever made” promise as it looks from the early previews of the Kno. Check out some impressive images of the Kno below.